Uninterruptible power system (UPS) is Eaton’s newest product line introduction featuring both line interactive and double-conversion technology UPSs. 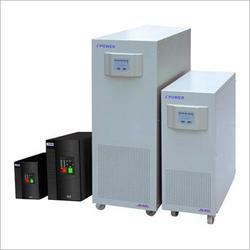 UPS, an Uninterruptible Power Supply, is an Electrical Apparatus that provides Emergency Power to a load when the Input Power Source, typically mains power, fails. UPS is typically used to protect Hardware such as Computers, Data Centres, Telecommunication Equipment or other Electrical Equipment where an Unexpected Power Disruption could cause Injuries, Fatalities, Serious Business Disruption or Data Loss. We offer Industrial UPS with single phase output power UPS system with range available from 10 kVA to 300 kVA, Industrial UPS with three phase output UPS system with range available from 10 kVA to 500 kVA.